Here on this spot, December 13, 1795 fell from the atmosphere an extraordinary stone. In breadth twenty-eight inches, in length thirty-six inches and whose weight was fifty-six pounds. This column in memory of it was erected by Edward Topham, 1799. "The History and Topography of the City of York, the Ainsty Wapentake and the East Riding of Yorkshire"
"Wold Cottage, the residence of J. Laybourn, Esq., is situated on the north side of the parish, and in a field about one-third of a mile nearly west of the house, a most extraordinary phenomena of nature occurred on the 13th of December, 1795, about three o'clock in the afternoon. 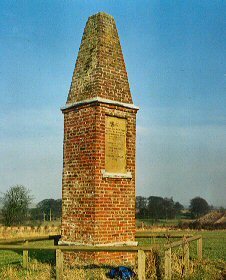 A singular stone, 28 inches in breadth, 36 inches in length, and weighing 56 pounds, fell from the atmosphere, and partly buried itself in the ground, on the spot where the late Edward Topham, Esq., of Wold Cottage, erected an obelisk in 1799, to commemorate the event. This stone is of a composition similar to most other meteoric stones which have fallen at various periods in different parts of the world, but it has no counterpart or resemblance to the natural stones of the earth." "An account of the falling of this stone, communicated by Mr. Topham, is published in a book on British Mineralogy, by the late Mr. Sowerby, of Lambeth Road, London, in whose museum the stone was deposited. From that account we learn that the stone passed through the air in a north-west direction from the sea coast, and numbers of persons distinguished a body passing through the clouds, though not able to ascertain what it was. In the different villages over which the stone took its direction, numbers of the people heard the noise of something passing through the air, and some persons saw it strike the earth, and deposed to the same on oath before Mr. Topham, who was a magistrate. It embedded itself 19 inches in the earth and chalk rock, and fixed itself so strongly in the latter, that it required some labour to dig it out. Before it touched the earth there was some thunder and lightning at a distance, but at its fall an explosion took place, which alarmed the surrounding country. Mr. Bigland, in one of his tours through Yorkshire, in 1810, saw a portion of the stone in the possession of the late Archdeacon Wrangham, at Hunmanby. It has a black and vitrified surface, exhibiting marks of a volcanic origin; the inside is white, and of a granulated but very compact texture; and its composition is totally different from that of any kind of stone yet discovered. Mr. King, the antiquary, in his account of 'sky-fallen stones', has published an account of this, with many curious and learned remarks on those which have fallen at different periods."